Fabio & Grooverider, the Godfathers of Drum & Bass, announce the headliners of their 25th Anniversary showcase this Friday in London. Fabio and Grooverider, the Godfathers of Drum & Bass and legends of modern music who are idolised worldwide. Industry heavyweights, fans and artists regardless of genre will readily respect and praise the ongoing influence of the two. 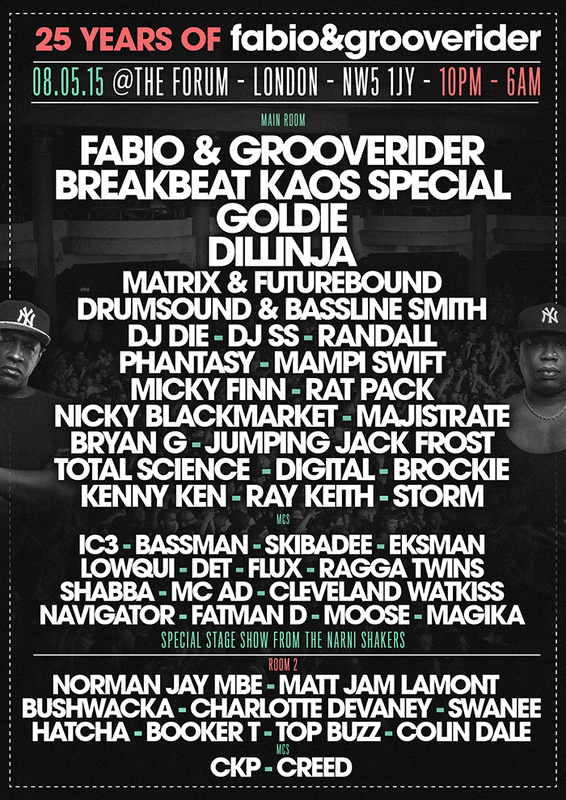 May 8 2015 at The Forum London sees them uniting alongside an array of special guests to celebrate their 25 prolific years as a duo: in House, D&B & Jungle. When the lights go up at 6am the next day those in attendance will have been part of something special, something delivered by two masters of the craft and delivered by an exceptional soundsystem. This will be a roadblock.